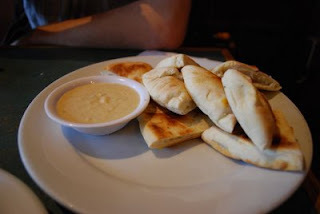 Discription:Hummus is a famous dip from Mediterranean cuisine. It is prepared in variety of ways some hummus recipes contain only puree of boiled garbanzo beans with olive oil while this recipe contains tahini and yogurt along with garbanzo puree which adds some more delicious flavor to the hummus. You may sprinkle paprika if you serve it with the pita bread to give some spicy taste. This hummus sauce can also be used in shawarama. Take a sauce pan to boil garbanzo beans with garlic for at least 30 minutes. To save your time you may use a good pressure cooker to boil beans, it would take hardly 15 minutes but make sure the water should enough in the beans so that the boiled water will be used later in this recipe. After that drain all the water from the beans and garlic and reserve it. Put the beans and garlic in food processor to blend them very fine. When the beans mashed completely add olive oil, tahini, yogurt, lemon juice, salt and half quantity of reserved water from beans. Blend all them together to make very fine smooth paste. Add more broth from beans if you feel that the hummus is very thick.